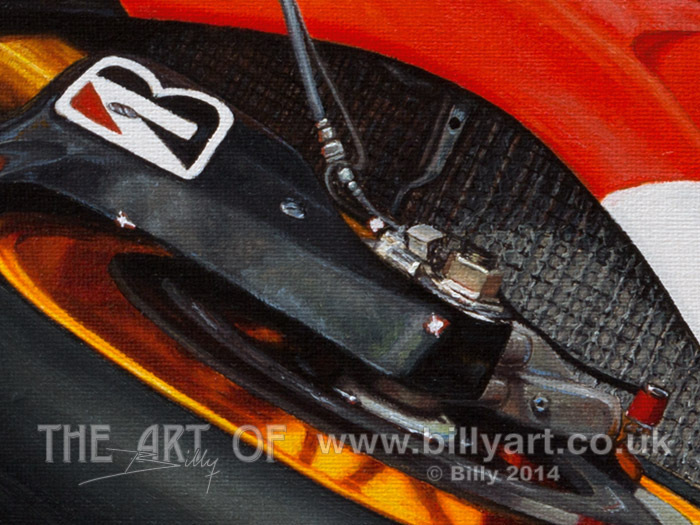 The watermark does not appear on the fine art print. 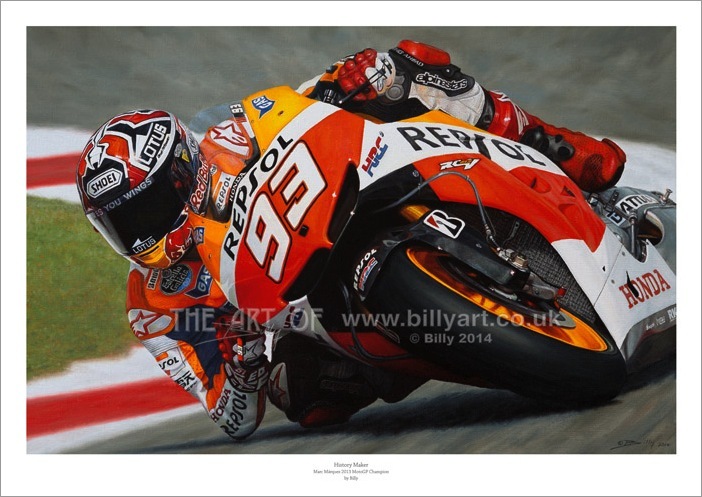 Marc Márquez 2013 MotoGP Champion open edition giclée fine art print by Billy. 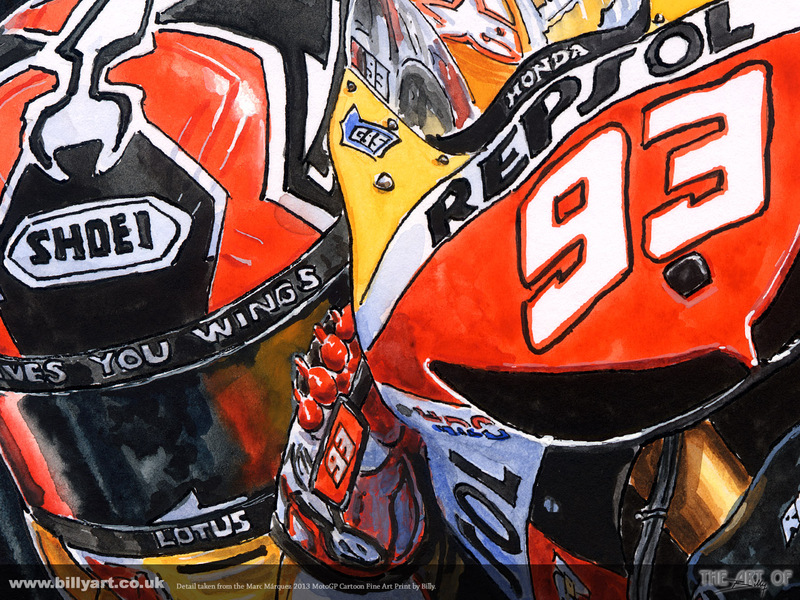 This fine art print by Billy of History Maker Marc Márquez 'El Niño' riding the Factory Honda RCV123V MotoGP race bike in the 2013 MotoGP championship is available in three sizes A4, A3 and A2. The 2012 Moto2 champion Marquez has been a revelation in MotoGP in 2013 with his 'elbow down' cornering, ruthless racing attitude and being the youngest rider to win a GP race in the premier class in his 'Rookie' year. Now Márquez has gone on to become the youngest ever MotoGP Champion in his Rookie season and broke many other records along the way. 35 years after Kenny Roberts in 1978 Márquez is the only Rookie to win the title in his debut season. Only 3 other riders, Mike Hailwood, Phil read and Valentino Rossi have won 3 different categories at world class Grand Prix level. Marc Márquez also was the youngest rider to win a Grand Prix race, get the fastest lap, pole position, lead the championship, win four races in a row, to have 16 podium finishes and amased the most points in his rookie season. 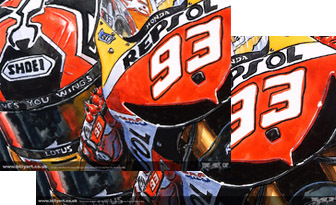 Details from the Marc Márquez oil on canvas painting. 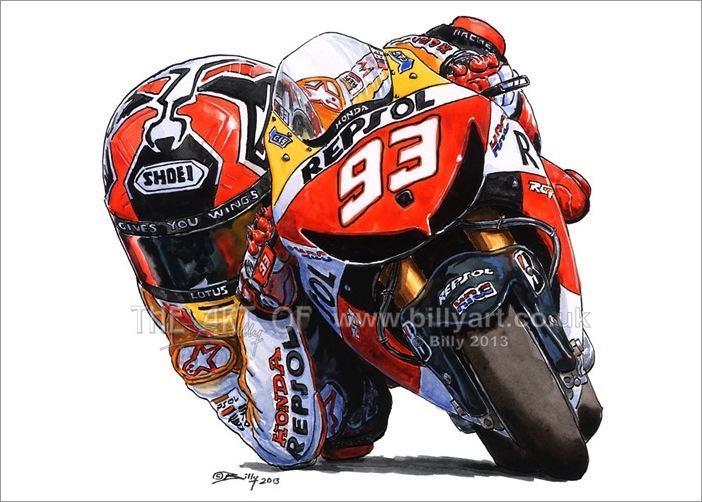 This cartoon art by Billy of Marc Márquez 'El Niño' riding the Factory Honda RCV123V MotoGP race bike in the 2013 MotoGP championship is available in four sizes A5, A4, A3 and A2. The 2012 Moto2 champion Marquez has been a revelation in MotoGP in 2013 with his 'elbow down' cornering, ruthless racing attitude and being the youngest rider to win a GP race in the premier class in his 'Rookie' year. 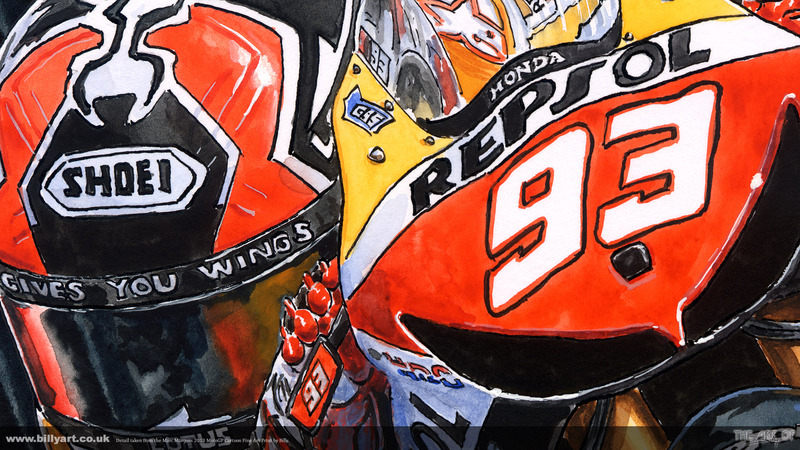 Now Márquez has gone on to become the youngest ever MotoGP Champion in his Rookie season. 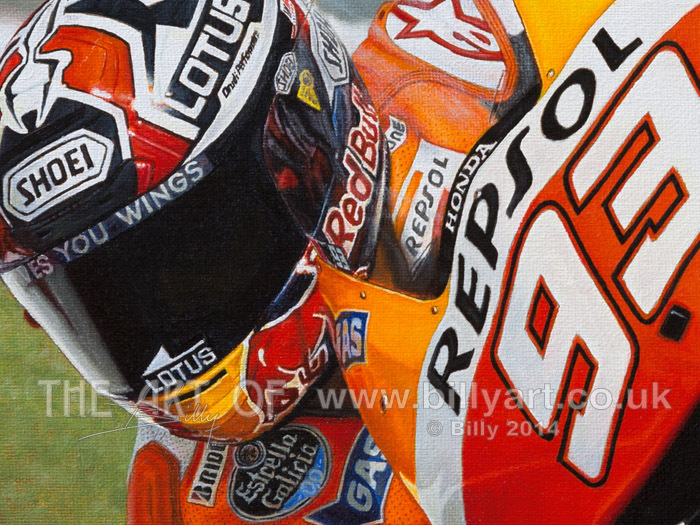 *These fine art prints of Marc Márquez have free UK Post and Packing. International orders have an additional cost as I use Royal Mail 'Airsure' or 'International Signed For' to ship them. Simply use the drop down button by the BUY NOW to select the size print you require from either the UK or International prices.